Winter is slowly but surely coming to an end and we couldn’t be more excited for some springtime sunshine and warmth. What perfect way to bring in the season than with a sophisticated tea party? 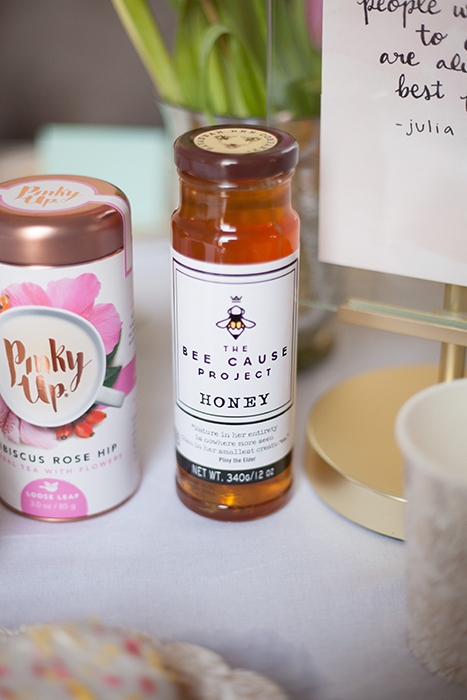 We tapped our friend from Love Always, Audrey to plan a garden-themed tea party with her friends where she ate a few donuts, sipped some Tazo and explained the necessary steps in hosting your own tea time. Here’s Audrey! I can’t stop thinking about spring. Even though Chicago’s winter has been pretty mild this year, I’m still super over it and ready for some sunshine and warmer weather. 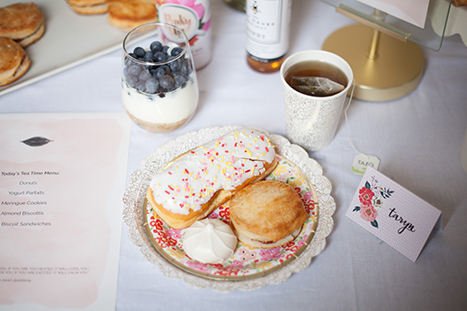 Amazingly enough, my daydreaming recently came to fruition with a fun tea party! 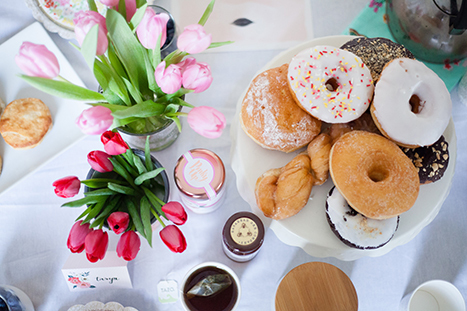 There’s nothing better than donuts with your besties. 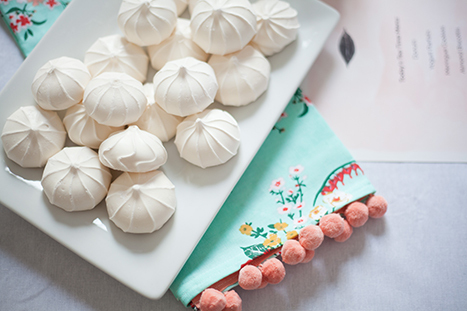 Include other treats, like meringue cookies, jam and honey biscuits, and berry yogurt parfaits so that your guests leave full, happy, and all sugared up. 2. Make the table pretty, but make cleanup easy. 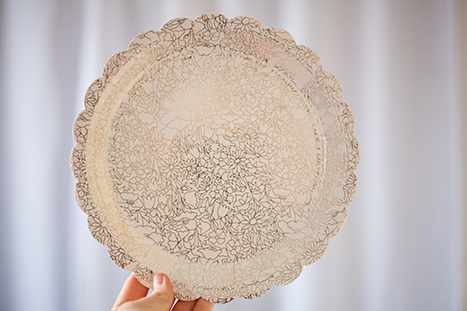 I used these paper plates to make the table look fancy, and since they’re disposable, clean up was a cinch. I also used some cute paper mugs which I thought matched the plates perfectly! 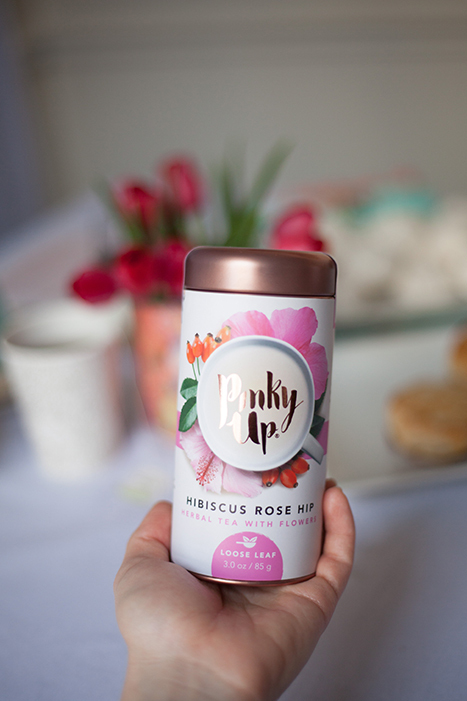 Also pretty was the Pinky Up tea (I almost didn’t want to open it! Almost.) alongside the Bee Cause Project honey. Functional AND freakin’ cute. 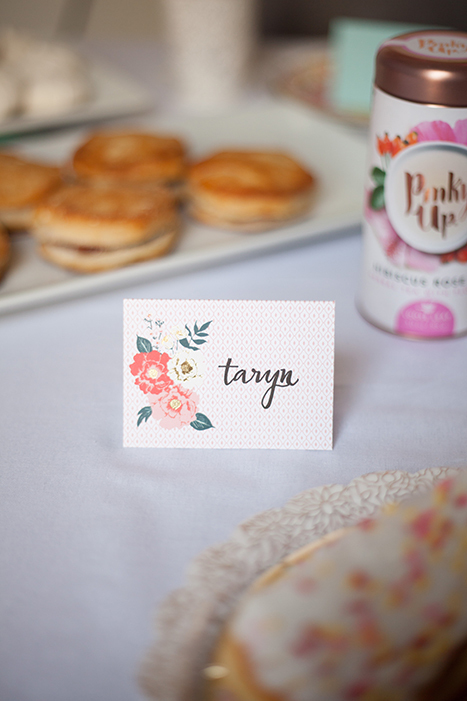 These place cards make everything feel so much more personal and inviting. 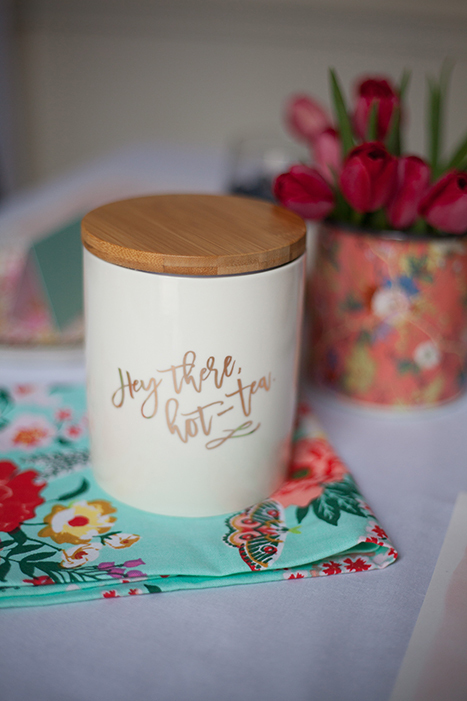 Add a bit of easy hand lettering, and your guests will feel so important. 4. Fresh flowers are a must. 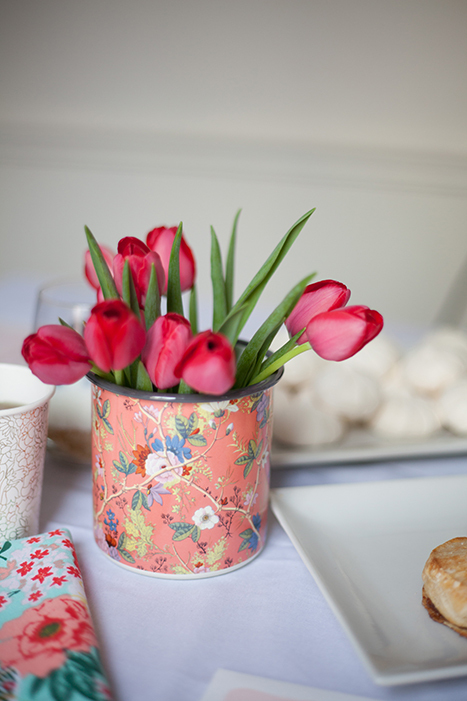 Tulips are SO inexpensive during the springtime, and they brighten the table up like crazy. I bought two colors and used this planter to show off some of my fresh blooms. Afterwards, I used my planter for some herbs! 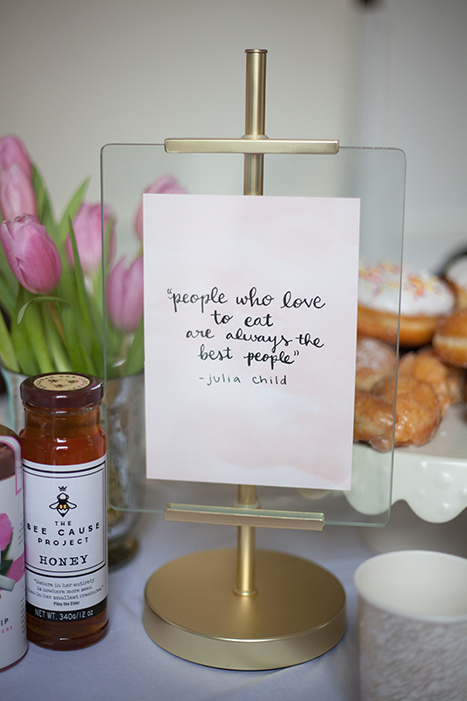 I used this adorable frame to display one of my favorite quotes from Julia Child. I hand-wrote the quote on this gorgeous pink watercolor paper, and used the same paper for the menus. Another thing that really brightened the table up were these pom pom tea towels. Obsessed is an understatement — what is it about pom poms that makes life so fun? Don’t be too serious! This isn’t high tea at the Drake, after all. This hot-tea canister is the cutest thing, and it’s currently displayed in my kitchen on my coffee/tea bar for all to see (and get a chuckle out of). Add some dimension to the table with some layering. A cake stand or 3-tiered stand is perfect for this, as are fresh flowers of different sizes. Have fun at your future tea party! I can’t wait to see what you choose to make it pretty and fun. Paper Source is giving away a party to one lucky group. Use the hashtag #MyPSParty on Instagram to show off your creative party elements for the chance to win! For more details, click here. I love that Julia Child quote. 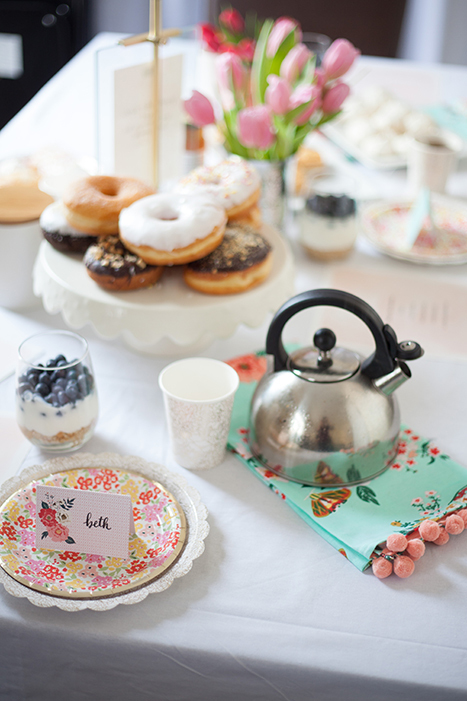 What a great party – the doughnuts look delicious, the plates are adorable, and that honey jar is fantastic.